America’s 2016 Democratic presidential flag bearer, Hillary Clinton, has rearranged her Twitter bio to reflect the counsel given her by Nigerian-born novelist, Chimamanda Ngozi Adichie. Late last month, Chimamanda had asked the former First Lady why her Twitter bio began with ‘wife’, rather than her career achievements. The two were talking at a PEN World Voices Festival lecture at the Cooper Union in Manhattan on Sunday, April 22, 2018. “In your Twitter account, the first word that describes you is ‘Wife.’ And then I think it’s ‘Mom,’ and then it’s ‘Grandmother. And when I saw that, I have to confess that I felt just a little bit upset. “And then I went and I looked at your husband’s Twitter account, and the first word was not ‘husband,’” Adichie said, while interviewing the ex-Secretary of State. 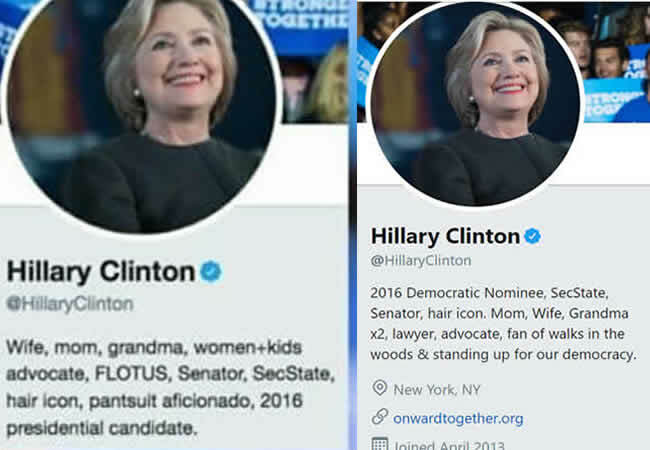 Hillary promised Chimamanda that since she had talked about it, she would rearrange the bio to reflect her (Hillary’s) professional achievements rather than her domesticity. It sounded like a joke, as the two women had laughed it off. 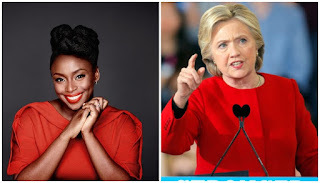 The encounter also generated heated debates on the social media, as many respondents did not only blame Chimamanda as being “confrontational, rude and always in your face,” they praised Hillary for showing her “family values” by talking about her domestic status rather than her boardroom or political accomplishments. Chimamanda also took a swipe at those who called her out on the issue. But Hillary eventually took the novelist’s advice and tweaked her Twitter bio to reflect Chimamanda’s correction.